Another spin-off to the legendary series of sandbox action games, developed by Rockstar Games for the PlayStation Portable console. As the title of the game suggests, its action is related to GTA: Vice City. 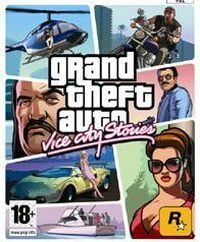 Grand Theft Auto: Vice City Stories is the second game developed by Rockstar initially for the PSP console only. The PS2 port was created afterwards. When creating the previous game (Grand Theft Auto: Liberty City Stories), the developers gained a lot of experience, thus their second game for hand-helds definitely makes a better impression. As the title suggests, the story is set in the areas the players previously visited in Grand Theft Auto: Vice City. The story is set in 1984, two years before the events of the original game. The player is put in the shoes of Victor Vance, an ex-marine and a gangster at the same time. Similar to other installments in the GTA series, the protagonist roams a huge city, steals cars, kills different targets for money, etc. In Grand Theft Auto: Vice City Stories for PSP and PS2, apart from driving ordinary vehicles, the player pilots choppers, rides jet skis, etc. When it is necessary, Victor is willing to swim himself as well. When traversing the game world in a car for example, the player listens to the radio stations known from GTA: Vice City, though the repertoire has changed. As a result, V-Rock delivers energetic rock tracks, Wildstyle Pirate Radio is filled with rap music again, and Radio Espantoso brings a portion of hot latino songs. In Grand Theft Auto: Vice City Stories for PSP and PS2, the protagonist wields many kinds of weapons, of course. Among these, one can find pistols, an assault rifle or a rocket launcher for example. Next to the set of weapons, the player makes use of different gadgets, mainly a bulletproof vest. It is worth mentioning that the player is allowed to enter many buildings, or that a huge fun fair in Ocean Beach can be visited, and one can reflect on the great views from a Ferris wheel (after switching to the FPP mode). Furthermore, interesting weather effects were implemented, including even hurricanes. The in-game physics are based largely on the ragdoll effect applied to the character models.